A True Honor And A New Cake Adventure ? 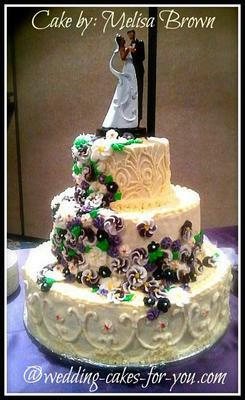 A dear friend who lost his wife just about a year ago gave me a call to ask if I would make his wedding cake. What a joy filled my heart to be asked a question like that. He was marrying his late wife's best friend and prayer partner, so I didn't think twice about saying yes to him. I knew I could make one of the best cakes he ever tasted and felt very comfortable with (almost) any design they would request. 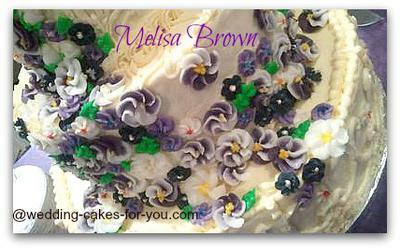 My only unbending standard is that all my creations are iced with buttercream. I order Amish butter online for my family that makes baked goods (and everything else it touches) taste like a sweet dream. They ordered a carrot wedding cake with a Red Velvet groom's cake. No problem. Right? Two weeks before the wedding, I decided to make some test cakes to be sure the carrot cake recipe I was going to use would be as good as the white cake recipe I usually serve. My family loved having all the cakes to eat. I finally settled on Lorelie's Best Carrot Cake recipe but I cut back on the sugar, whipped the egg whites separately and folded them in last, substituted cardamom and nutmeg for half of the cinnamon, substituted coconut oil and butter for the corn oil, added a little almond extract and lemon flavor with the vanilla and left out the raisins. I also wanted to try to make a Red Velvet cake without the artificial color. So I brewed up some hibiscus tea and reduced it to a bright, bright red color. I made a tray of test cupcakes using the rest of Lorelie's Red Velvet Cake recipe.Fail! As soon as I added the concentrated tea, the color turned brown. I baked up the cupcakes anyway. They were DELICIOUS and brought new meaning to the name, "Tea cakes". For this wedding, I stuck with Lorelie's recipe and used the *sigh* artificial red food dye. My color experiment was worthwhile, because now I really want to try baking cakes successfully with tea and natural food colors. Hmmm, a new business??? Maybe. all the color requests in the flowers that I made with Royal Icing. I made the flowers days in advance to allow the colors to fully mature. I had their wedding invitation to be able to tint the icing to the perfect shade of plum. The funny thing was that the wedding decorator did not have as fine a success with the color so the colors at the venue were more of a purple. Oh well, it didn't clash too badly. 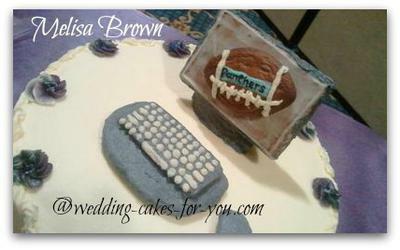 It was also a personal challenge to top the groom's cake with what he requested - a little football and a computer. I know he was thinking to put just pieces of plastic on there, but I couldn't do that. It would look so, so, plastic! compared to the rest of the cakes' details. My daughter has made some of the cutest gingerbread houses for her friends, so it was easy to figure out a way to top the groom's cake with something clever and edible. My icing did not work out as well as I wanted, but it was still attractive once it was all put together and effective. The cookies were delicious too. Because it was a second wedding for a "mature" couple, I figured it was not going to have all the pomp and food that a first-time wedding would. I figured the cake would be the main refreshment. I decided at the last minute to make a third cake, a traditional white wedding cake, for anyone who might not want either of the two flavored cakes. I was glad I did. 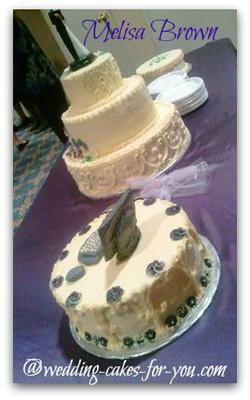 The white cake was the one people really wanted and disappeared in a matter of minutes. Everyone completely enjoyed all the cakes; I got nothing but compliments and applause for their exceptional flavor as well as their beauty. But it was the look on the bride's face that really made my heart fill with thankfulness and joy to be able to bring to her wedding exactly what she was hoping for. She had lost her first husband over 35 years ago, and I'm sure she never thought she would find herself a bride again. Being able to make a unique cake especially for her and my friend is a pleasure I can not fully describe. I am honored to have this talent to offer some very special couples. Comments for A True Honor And A New Cake Adventure ? Melisa What a great story. So touching. I also LOVE your creativeness with the recipes. Amish butter sounds like it would be fantastic too. I'm sure the couple was very happy with your special touches and incredibly delicious creations. Thank you for your tips and story and beautiful photos. I am sure that many people will see your creation and be quite inspired by it. One more thing the "Tea Cakes"idea. Go For It!!!!! Great story! So glad that all the experimenting paid off and that all the cakes were a hit! That is an awesome story. Your cakes are beautiful! I thank you all too. I love the cake-bakers community. You are all as fine and beautiful as your cakes. Thanks for the kind comments. They are very encouraging. This is where I get my Amish butter. http://www.minervacheese.com/ I am able to get bulk pricing because I order all my Minerva products in cases. When the Amish butter goes on sale, I buy a whole case. I also contact all my interested friends and offer them the same discounted prices. I don't mind splitting up cases for them. Everyone walks away with delicious dairy at really good prices. It's like a dairy co-op. Thank you for the Butter information I appreciate it very much.